April is financial capability month, and the Neighborhood Partnerships team is hard at work making financial capability a reality in Oregon. We know from recent research that Oregonians, like all Americans, face barriers to financial stability, and that plans often get derailed by an unexpected expense of $400. Strong savings habits can help along with good financial decisions, but we also need public policy that creates possibilities and opportunities. Children's savings, homeownership support, and stability for the 4 in 10 Oregonians that rent their homes -- all are about increasing predictability and giving people a chance at a better future. Read on for more about what we're doing -- in close partnership with so many of you -- to build financial capability and a stronger Oregon. There’s nothing quite like watching all of your months and months of hard work start to pay off. Which is exactly how we felt watching the Oregon Bright Futures hearings unfold this Tuesday in the House Early Childhood and Family Supports and Senate Education committees. We met with each committee to talk through the Children’s Savings Account platform we have designed for Oregon and to explain exactly how we plan to create a savings culture and a college going culture across the state. Our three legislative champions, Representative Knute Buehler, Representative Karin Power, and Representative Janelle Bynum, kicked things off and demonstrated how committed they are to ensuring we create a brighter future for Oregon’s Children. Housing opportunity is one of the top issues at the Oregon Legislature this year, and the Housing Alliance has a comprehensive agenda to help meet housing needs across Oregon. Recently, the Housing Alliance as a member of the Stable Homes for Oregon Families Coalition reached a big milestone in protecting the 4 in 10 Oregonians who rent their homes when HB 2004 passed out of the House on April 3. It now moves on to the Senate! Budget hearings have already begun, and the Oregon Housing and Community Services budget hearing brought advocates from around the state to talk about the importance of safe and stable housing. Many people shared stories about the importance of emergency rent assistance, development of new affordable housing, preservation of existing affordable housing, and affordable homeownership opportunities. We have a range of bills that would complement these investments to advance housing opportunity. Read more about what’s happening here, and save the date for our next Housing Opportunity Day, May 18! 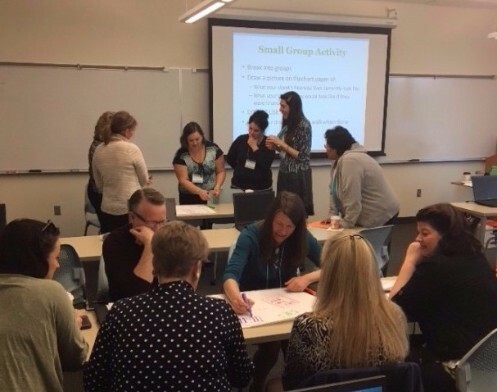 On Monday, March 20, Janet and I traveled to Bend to facilitate a training with NeighborImpact on a great toolkit- Building Financial Capability: A planning guide for integrated services. We had a great turn out with representation from thirteen different organizations who came together to learn about opportunities to better connect clients with financial capability services. Financial capability refers to the combination of knowledge, skills and access to resources that make it possible for each of us to manage our financial resources effectively. Financial capability services include things like financial education, credit counseling, and matched savings programs like the Oregon Individual Development Account (IDA) Initiative and Children’s Savings Accounts. With legislative session in full swing, we need your support more than ever. Please consider making a donation right now to help people travel to Salem to share their experiences directly with legislators. Gas money, child care - every dollar counts. You can donate by clicking the link below. Save the date for the 2017 RE:Conference – October 17-18, 2017! Plans for this year’s conference are underway and we already know you will not want to miss it! Looking for a way to support the conference and get involved? Consider a sponsorship. Find out more in the 2017 RE:Conference Sponsorship Package. The Oregon Asset Building Coalition is working to help create a space for asset builders and financial capability service providers to come together to share best practices, identify community needs, and create a more unified vision for improving financial well-being in Oregon Communities. We hope folks will join us at the Salem Convention Center on Tuesday, April 18, immediately following the Oregon Opportunity Network Spring Industry Conference from 4:30-7. This will be an opportunity for us to network, build relationships, and start to plan the path forward. We started this conversation in February and we want to keep building our momentum. If this is the first you are hearing about this effort we welcome you to join us and tell a friend! We hope everyone who works to improve the financial lives of Oregonians will join this movement. Learn more about the event on April 18th and register to attend here. Copyright © 2017 Neighborhood Partnerships, All rights reserved.